Zach Mettenberger’s injury at the end of the 2013 season opened the door for then freshman Anthony Jennings. Jennings was impressive in a 99 yard TD drive to lead LSU over Arkansas. On the flip side, he struggled in the Outback Bowl against Iowa going 7 of 19 for 82 yards and throwing an untimely pick. Having seen good and bad from Jennings, he entered spring as the most likely candidate to take over at QB for LSU in 2014. Early in spring camp, true freshman early enrollee Brandon Harris, who was one of the top QBs in the 2014 class, started making waves. Just two practices in, Harris and Jennings were already embroiled in a tight competition. This past Saturday, in LSU’s spring game, Harris took a step forward. Harris completed 11 of 28 passes for 195 yards on the afternoon with three touchdowns and also had 61 yards rushing on three carries and added a touchdown on the ground. While those stats don’t jump off the page (especially the completion percentage), you have to consider that he is just a true freshman getting his first taste of the college game. His counter-part, Jennings, struggled mightily in the game. Most notably, Jennings threw two interceptions that were returned for touchdowns. Overall, he was 9 of 17 for 157 yards passing and did go out on a positive note as he led a 73 yard scoring drive on his last possession. When the 2013 season ended, most thought Jennings would be under center for the Tigers to start 2014. After 15 practices, LSU now has some major questions at quarterback and Les Miles isn’t ready to declare a winner in this battle. In his first year, Offensive Coordinator Cam Cameron increased LSU’s points per game from 29.8 to 35.8. Now he faces the daunting challenge of replacing Mettenberger, Jeremy Hill, Jarvis Landry and Odell Beckham Jr. Oh yeah, they also open the 2014 season against Wisconsin. Miles and the Tigers have a decision to make and while they won’t make it until the fall, it would be in their best interest to declare a winner in this battle early in fall camp. 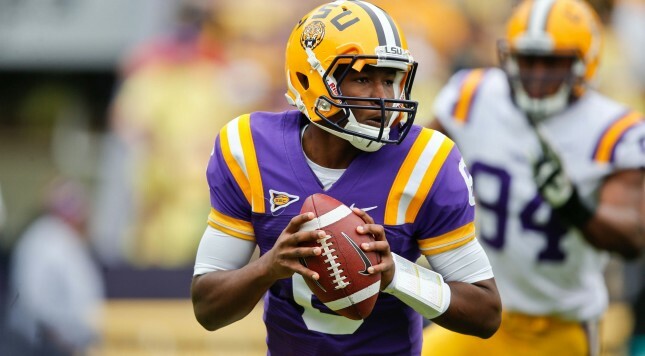 Based on what has happened so far, we might just see a surprising face under center when LSU takes the field at Reliant Stadium for their season opener.